Cinematographer G Murali says he shot nearly half of Karthi-starrer forthcoming Tamil action-drama Madras at night using natural sources of light in real locations. "We must have shot about 40 percent of the film or even more at night. Some places become quiet around 10 pm. But the place where we shot the film, life comes alive at night and most of the story takes place at that time," said Murali. The film was predominantly shot in a few places in and around north Chennai. "We relied mostly on source light to shoot at night. When we were shooting on a street, we used the light that leaks from a street lamp to a passing vehicle. We also used the light that leaks from a house on the road," he said. "We tried to keep everything very realistic. The street lamps in the places where we shot are not as bright as other places of the city, but we still didn't try to enhance it," he added. Directed by P Ranjith, Madras was initially planned to be shot on film but eventually was shot digitally due to certain constraints. "The plan was to shoot using film as it's getting obsolete. Since most of the movie has been shot in real locations using live colours and light, we felt only film could enhance the overall experience. But the pipelines that lead to processing of film reels have hit a dead end," he said. "We eventually had to go digital. But we wanted a digital camera that was more close to the experience created by shooting on film. 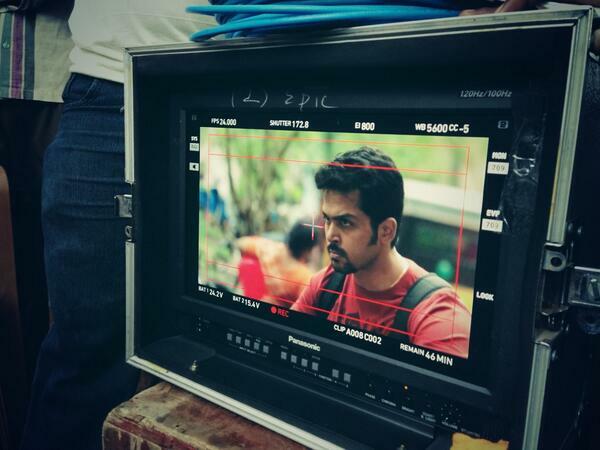 We finally used Arri Alexa XT as it generates the kind of output that's more real and less digital," Murali added. According to Murali, Madras would offer a realistic view of life in north Madras. "We've tried to capture life in these places as realistically as possible. This film gave me an opportunity to work very closely with real people. In most of our shots, we've tried to portray action that happens in the background of a scene as well," he said. Murali initially was 'apprehensive' about working with a star like Karthi, but all that changed very quickly. "Karthi sir never behaved like a star on sets. He was one among the residents of the place where we shot. Had we shot for a few more days in that place, people would've accepted Karthi as one among them. He made us see him only as the character he was playing," he said. "The director would call Karthi by his character's name on sets. Everybody got into the skin of their characters and that really helped us to shoot smoothly," he added. Also starring Catherine Tresa, Madras, which releases in cinemas on Friday, is produced by Studio Green.